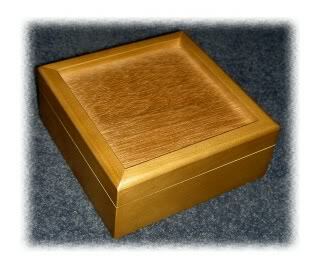 This solid Alderwood box measures 5.125" by 5.125". The top has a recessed area that measuring 4.25" by 4.25" that is PERFECT for mosaic! The top is attached to the bottom with two brass hinges. The outside is stained and the inside is natural. The bottom has 4 felt feet to protect your furniture.